Welcome to Evergreen Coho SKP Park! We hope you enjoy many activities and adventures visiting the Olympic Peninsula, as well as your days here at Evergreen Coho SKP Park. For specific operational questions about the Park, please check with the Office. We SKPs are happy to chat with you, of course and we hope these notes further help you settle in. You will find tourist maps, guides and handouts at the front door of the Clubhouse and in the Game Room. You are welcome to join in Park activities on the current calendar. Some events require signup and/or tickets (Sign up at the Activities/Info/Signup Table inside the Clubhouse. Buy tickets in the Clubhouse per the event’s information schedule. Laundry Room: You must sign up to reserve your time slot and # of washers/dryers. At Evergreen Coho SKP Park, we enjoy many activities and adventures on the Olympic Peninsula. Here are some local resources to help you settle in and explore! Deli case with house-made selection of natural foods: vegan, vegetarian and otherwise. Some cafeteria-style hot food. Smoothies are custom-made. RV parking in the “triangle” across from the front door! 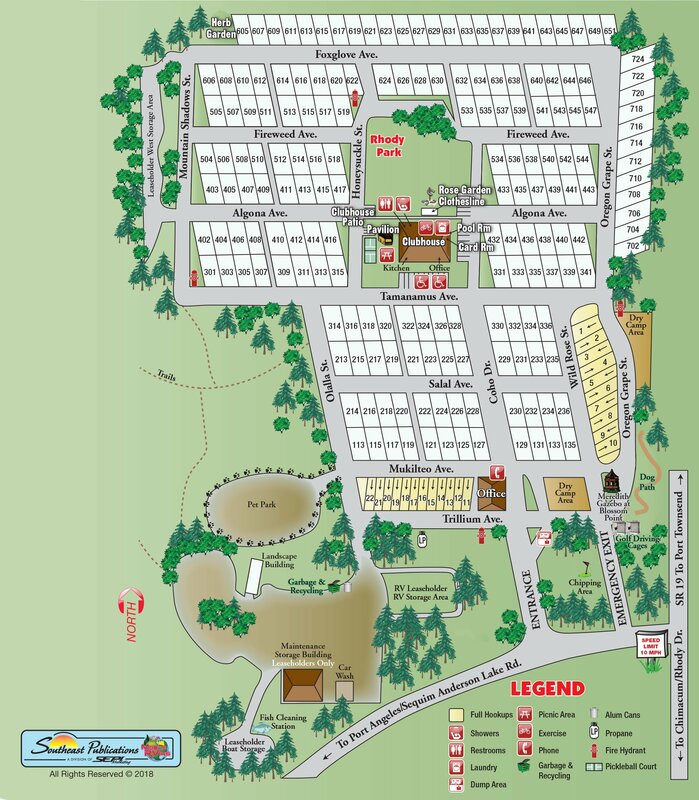 The Park is a 55+ RV Park located approximately 8 miles south of Port Townsend and 1.5 miles from Port Hadlock. Port Townsend is the larger of these two communities and many of its Victorian homes are on the National Historical Register. Both communities are located on the waterfront and they have good shopping, banks, churches, medical and other facilities. Our air is clear, our water is excellent, and we are free from the congestion and pollution of large cities. Our weather is moderate, as we are located in the shadow of the Olympic Mountains, an receive only 17 to 20 inches of rain annually, mostly during the winter months. Port Townsend has ferry service to Whidbey Island, with continuing ferry service to the San Juan Islands. Seattle is a 45-minute drive, plus a 30-minute ferry ride away. Heading west from the park, you will reach the spectacular Olympic Mountains and Port Angeles--with great fishing. Kitsap shopping mall is in Silverdale, about 32 miles SE. Costco, Walmart, Home Depot and other “big box” stores are within 30 miles. Of interest to military retirees, Naval Base Kitsap in Bangor and the VA Medical Clinic lie to the south in the Silverdale/Bremerton area. 26 miles to the west, Sequim is known for lavender farms and its Lavender Festival in July, as well as the Dungeness Spit / National Wildlife Refuge. Evergreen Coho SKP Park consists of 175 leaseholder lots. Each site is 39' x 70’, with full hook-ups and at least one storage shed. “Common areas” are scattered throughout and provide colorful landscaping and open space. A spacious clubhouse is central to the Park community as a gathering place and for various activities and resources including a card room, library, exercise and craft areas, kitchen, showers/restrooms, BBQ and laundry facilities. The entire Park is surrounded by stately evergreen trees. Evergreen Coho SKP Park is one of Escapees, Inc.’s Co-Op parks. To be a leaseholder here, you must maintain a current membership in Escapees, Inc. Occupancy is limited to two (2) adults per site (one of whom is 55+, but no one may be under 18 years of age), and two (2) pets. Since we are a recreational vehicle park regulated by the Jefferson County Camper Club Ordinance, mobile homes are not allowed. We have wonderful sharing, caring and contributing members. New members are encouraged to participate in the social and volunteer activities to quickly become acquainted with their fellow leaseholders and share the warmth and friendship of our Park. The Park is administered by the members themselves through various Standing Committees and a 9-member Board of Directors (all volunteer positions). All park members are expected to contribute time and talents to the Park, thus building community spirit and reducing costs! There is a niche for everyone’s abilities and capabilities (from being an eager supporter, to working on activities like Clubhouse, Kitchen, Landscaping, Lot Maintenance, and more). Day-to-day operations are the responsibility of the Park’s two employees: the Business Manager and the Facilities Manager.